2 scoops Total Soy Vanilla, 1/2 cup egg substitute, 1/4 tsp ground cinnamon, 2 slices whole wheat bread, 1/4 cup light maple syrup. Spray a large nonstick skillet or griddle with butter-flavor cooking spray and place over medium heat. In a shallow dish, combine Total Soy with egg substitute and stir with fork until smooth. Sprinkle in cinnamon. Dip first slice of bread and let soak on both sides briefly. Repeat with second slice of bread. Place the battered bread slices in skillet, spooning any remaining batter over slices. Cook 2-3 minutes per side or until golden brown. Plate your french toast and microwave syrup approx. 15-20 seconds, if desired. 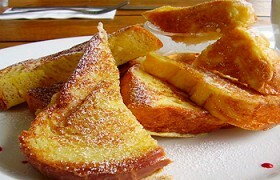 Pour syrup over your french toast and serve. This entry was posted in Total Soy Recipes and tagged easy recipes, high protein, meal replacements, Naturade Total Soy, protein drink, protein rich desserts, protein shakes, recipe contest, Recipes, soy, soy protein, soy protein recipes, Total Soy recipe contest, vegetable protein recipes.